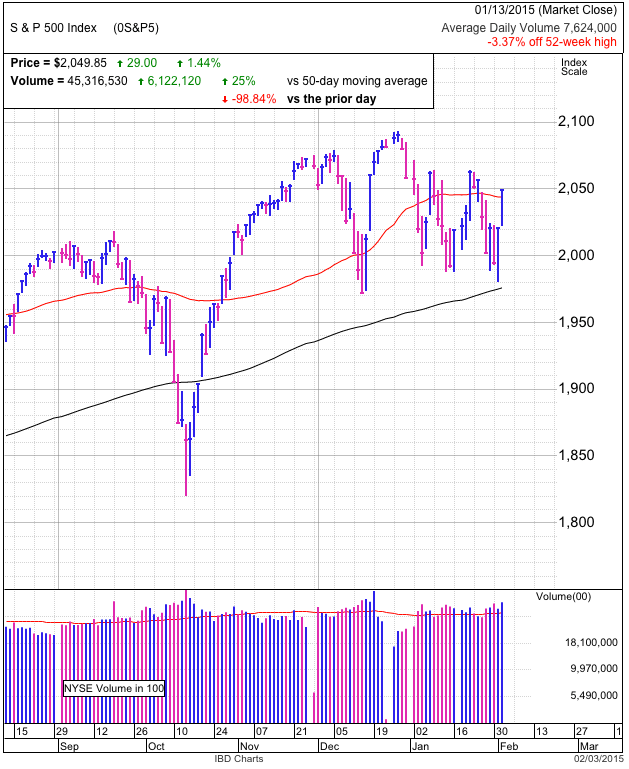 Stocks slipped modestly on below average volume as the trend of tight trade continues. We remain above 2,100 support, but breakout buying is noticeably absent. I’ve been inclined to give the market time to make its next move, but this anemic wedge higher is a concern. This resilience in the face of materially bearish headlines shows owners are reluctant to sell regardless of the economic and geopolitical news. The resulting tight supply has been propping us up. While this conviction is providing stability in an uncertain world, we need broader buying to keep pushing us to the next level. Short covering and technical breakout buying got us this far, but now we need a larger pool of buyers to step up. If few are willing to buy record highs, then it doesn’t matter how tight supply is. My biggest concern is the swelling bullishness without much price appreciation. Stocktwits’ SPY stream has gone from 40% bullish in January to 62% bullish tonight. In recent months 60% has been the magical sell signal and is why it feels like this rebound is stalling due to a lack of new buying. When everyone believes in something and is fully invested, there is no one left to keep bidding up the price. Depending on a person’s timeframe, they could hold through the dip to support that purges this excessive bullishness. But anyone with new money should hold off buying and wait for better prices in coming weeks. 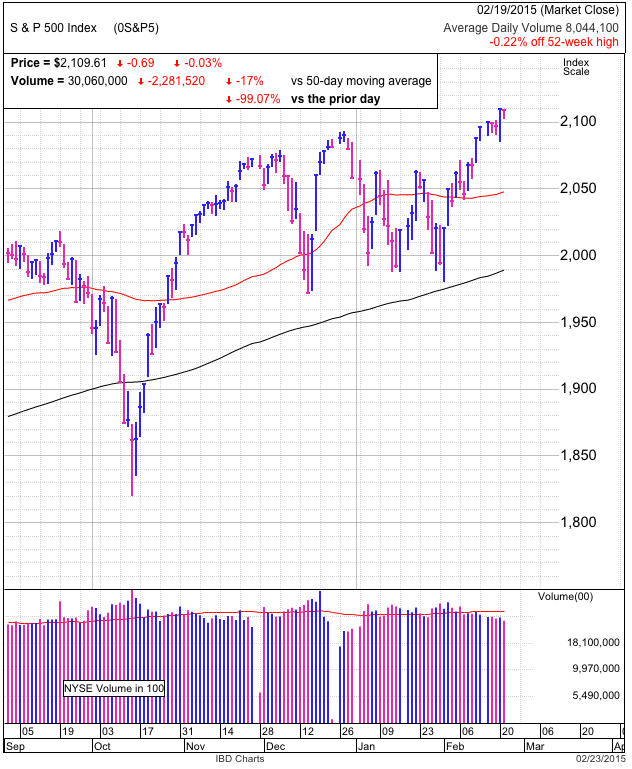 Stocks traded in a tight, five-point range Monday, consolidating Friday’s breakout to new highs. While we spent all of the day in the red, such minor losses are constructive because it shows few owners are taking profits or selling defensively. Bullish sentiment is ramping up and at the highest levels since December’s top. 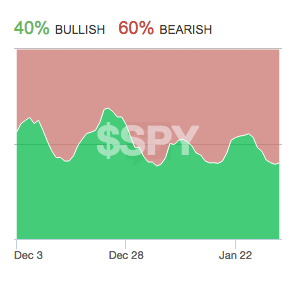 While rising sentiment gives us pause, 56% bullishness could easily give way to 65% or 70% in coming days. It is important to watch sentiment, but it is only a secondary indicator. Price is the main driver of trading strategy and so far the price-action is strong. The most impressive thing is how well the market is weathering the storm of bearish headlines. On-again, off-again negotiations between Greece and Europe couldn’t dent this rebound. Neither could a failed truce in Ukraine. And it’s been a while since we had economic numbers exceeded expectations. All of these headlines should have sent us into a 200-point tail-spin, but when the market doesn’t do what it is supposed to, that is a very clear signal it wants to go the other direction. If we don’t selling off on negative headlines, what is going to happen when we finally get some good news? While I remain cautious of this market because of the rising bullishness, this strength cannot be ignored. Right or wrong, stock owners are not interested in selling. Without sellers, supply stays tight and prices continue creeping higher. Until we find something that finally cracks bulls’ resolve, the only direction to trade this market is higher. Stocks were unable to break through 2,100 for a fourth day. Should we be worried? There are two ways to interpret this price-action. If demand dries up above 2,100, that tells us this rebound is running out of steam. The more bullish interpretation is we are consolidating recent gains before making the next leg higher. How do we know which scenario applies here? Technicians claim all we need is price, but price alone doesn’t give us the answer. We need to dig deeper into the market’s psyche to figure out what traders are thinking and how they are positioned. We would be stalling if the market was unable to break 2,100 with bullish headlines blowing at our back. When things are as upbeat as they can get, yet the market fails to make further progress, that tells us we ran out of buyers. With headlines screaming Greece, Ukraine, rate hikes, falling oil prices, and slowing global growth, it is a big stretch to claim this rally has a tailwind. It is far easier to make the argument we are stubbornly holding up in the face of a tidal wave of bad news. Bears are dumbfounded by how “stupid” this market is for not breaking down when there are so many obvious reasons we should be plunging. But here’s the thing, these bearish headlines have been around for weeks. Anyone who fears these stories sold weeks ago to buyers willing to own these risks. Once everyone who is afraid of an event leaves the market, then it can no longer hurt us because there is no one left to sell it. And that is exactly what happened. Greek and European negotiations blew up in a spectacular fashion Monday, yet Tuesday we set record highs. Strength in the face of bad news tells us this market still wants to go higher. Short this market at your peril. Stocks ended flat as all eyes were turned toward a meeting between Greece and European finance ministers. While progress was made, they failed to reach an agreement and pushed the final deal making to Monday’s meeting. Clearly the market should be paying attention, but is it something we need to worry about? It seems every bearish amateur investor with a Twitter account is proclaiming the #Grexit will annihilate our market. They confidently believe they have some cunning insight that everyone else is too stupid to recognize. But do they really? In the summer of 2008, very few professionals knew what MBS and CDS stood for, let alone the risks they posed to our financial system. Only in the aftermath of the collapse did people finally realize what happened. Now compare that blindside to the Grexit that retail investors have been discussing in coffee shops for nearly five years. Everyone in the market is fixated on each twist and turn in the Greek story, meaning if this thing blows up, it won’t catch anyone by surprise. Some predict this is just another false alarm, but even the optimist is well aware of the risks because this story is moving so slowly it is nearly old enough to enter kindergarten. With so much time to prepare, major institutions long ago hedged their exposure and a Greek default will be as traumatic to our financial system as Y2K was. And there is another thing, markets tend to blow negative news out of proportion. The herd gets spooked and traders stampede for the exits. But we haven’t seen the fear of the unknown and the herd selling yet. What gives? While every bearish amateur is waiting for the other shoe to drop, what if it already dropped, only no one heard it? If everyone knows about something and has plenty of time to prepare, doesn’t that mean it is already priced in? Hasn’t everyone who fears the #Grexit had plenty of time to sell? If all these people sold ahead of time, then who is left to sell when it happens? Contrary to popular perception, the market doesn’t need to crash for bearish news to be priced in. There are a lot of things for us to worry about, but the Grexit is not one of them. The market is not reacting to these headlines, not because it is stupid, but because it is more savvy than the amateur investors predicting its demise. If you enjoyed this post, retweets are always appreciated! 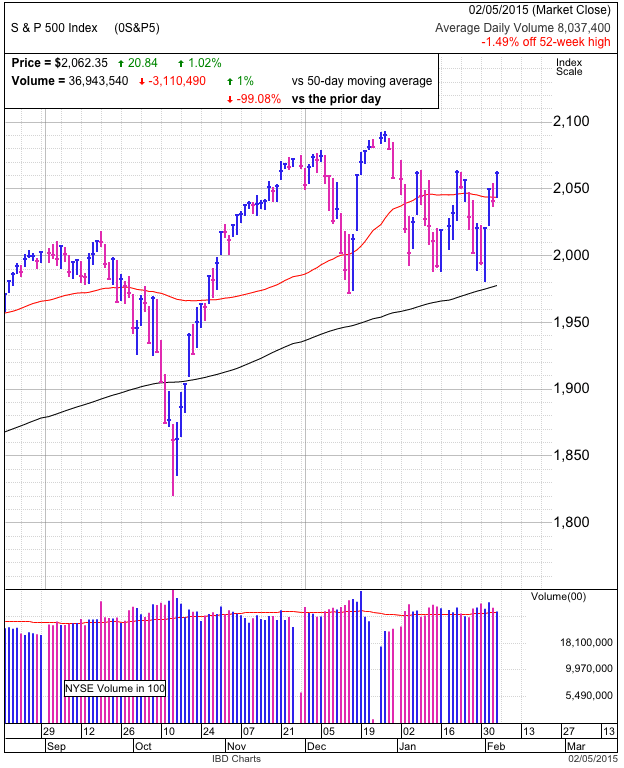 The S&P500 rebounded from recent weakness and ended at the highest close of the year. Declining oil prices were no longer an excuse for traders to sell stocks as oil gave up a portion of recent gains. The headline justification for today’s rally was a softening of the standoff between Greek leadership and the ECB. Greece’s new leaders are discovering there is a difference between making campaign promises and being held accountable for the unintended consequences of those decisions. While the Greek situation could continue to unravel, anyone who fears a Grexit already sold. Those that are left demonstrated they are mostly indifferent to the whole situation and are just as likely to ignore the next round of headlines out of Europe. When the market is sitting 1% from all-time highs in spite of the fearful headlines, it shows it doesn’t care about these concerns because they are already priced in. Market strength in the face of fear mongering is a buying opportunity. That doesn’t mean the rally is invincible, only that bears will need to come up with something new and unexpected if they want to break the market. Technically the market is acting well. 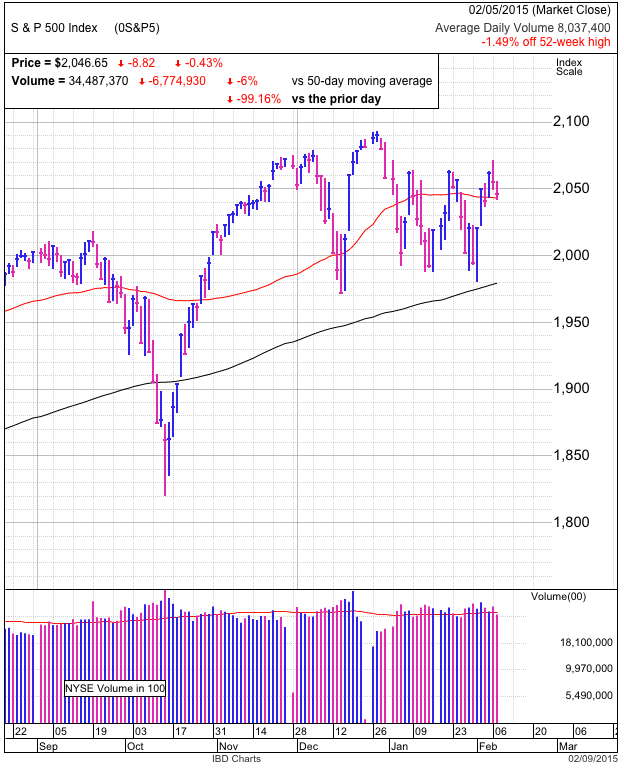 We found support near 2,050 and the 50dma, setting the stage for today’s upside move to 2,070. The pain trade is betting against the bears since further upside will force them to cover their shorts. While I expect higher prices in the near-term, I remain cautious further out. The last few years have been an easy, elevator ride higher, but a recent increase in realized volatility shows the market’s personality is shifting. At this point I’m far more likely to sell a breakout to all-time highs than buy it. But I reserve the right to change my mind as new information comes to light. Stocks stumbled for a second day on intensifying rhetoric from Greece’s new leadership. That was enough to spook European markets and bring ours down in sympathy. But the low-volume, 0.4% loss was almost sleepy as compared to recent volatility. While the S&P500 failed to hold 2,050 support, there was little urgency from participants to sell the violation. Owners seem fairly comfortable with these headlines and price-action. That confidence would crumble if losses accelerate, but as long as owners continue holding, we won’t have the supply necessary to pressure prices. Last week’s rebound relieved bulls, but sentiment remains cautious. AAII and Stocktwits sentiment measures saw a big drop in bullishness last week, no surprise given recent headlines. But stable prices in the face of fear-mongering means most of it is already priced in. Those afraid of these headlines had plenty of time to sell, meaning anyone still holding stocks is demonstrating a willingness to own this risk. While any number of geopolitical situations could flare-up, stability around 2,050 for a couple more days tells us the market is inclined to continue higher. When the market has every reason to sell off, but it insists on going higher, don’t fight it. On the other hand, if we cannot hold the 50dma Tuesday, we have a date with the 200dma. 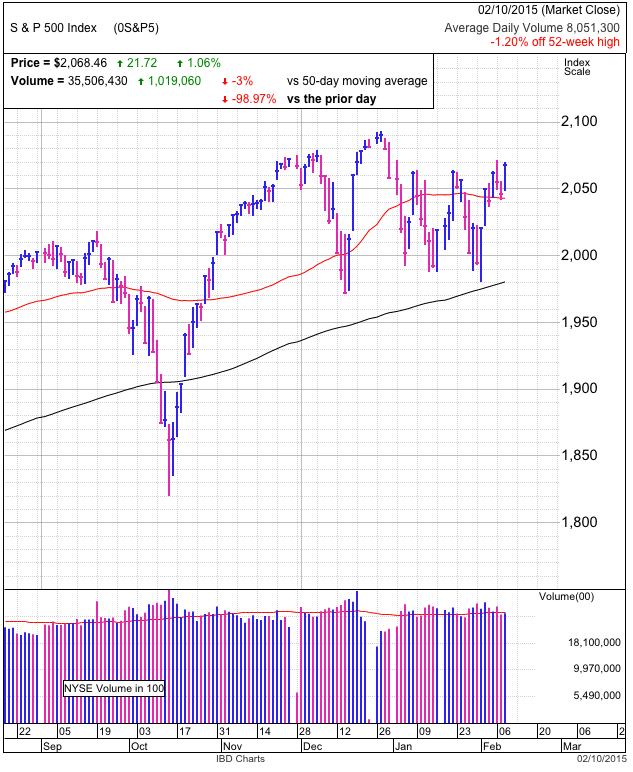 Stocks continued the rebound, adding another 1% and closing just shy of January’s double tops at 2,065. Volume was average, but lower than the last six days of elevated trade. While the market surged 15-points at the open, from there it was one of the most benign days of the year as we traded inside a five-point channel between 2,055 and 2,060. I cannot remember the last time we saw such laid-back intraday trade. We finally “broke out” to the upside in the final minutes of the day, if you count a two-point move to 2,062 as a breakout. Just a few days ago I was talking about 120-point intraday swings and now a two-point surge at the close is the best we can do. Amazing how quickly things change. Calm, rational, stable trade is good for the markets, suggesting this is more than a dead-cat bounce. Sentiment remains in the toilet. Stocktwits’ SPY stream is 55% bearish while the latest AAII survey showed bearishness surging 10% and bullishness plunging 9%. It appears recent volatility and fearful headlines have discouraged a large number of retail investors. But just when things look the worst is usually when they turn around. This is where the last of the hopeful holdouts call it quits and sell their stock at a discount because they cannot stomach the thought of another downday. But once they finish selling, supply tightens up and we bounce. And so far that is exactly what’s happened. Everyone who fears falling oil prices, Euro uncertainty, and volatility sold to thick-skinned bargain hunters willing to hold the risk. The current crop of owners demonstrated a willingness to own this uncertainty. That’s why when oil falls or tensions flare up in Europe, the market is indifferent. The new owners don’t care about those issues. Right or wrong, prices remain firm when no one sells. Friday morning we get employment. While this is usually good for a few minutes of volatility, it’s been years since an employment report changed the direction of the market. The talking heads love to hype it up, but it will be ancient history by lunchtime. Technically the big milestone is 2,065. We were turned back twice in January at this level and a lot of traders will be watching it. If we break it, expect a wave of breakout buying and short-covering. From there we will have to see how the market behaves before deciding if this bounce has the resilience to continue to all-time highs. Stocks slogged through most of the day in the red, taken down by a huge drop in oil prices. A late-day rally shook off the early doldrums, pushing us into the green, but that was short-lived as a last-minute headline out of Europe sent the market tumbling into the close. As dramatic as that sounds, the day was a fairly benign relatively speaking. The market traded sideways, mostly staying between 2,040 and 2,050. This compares favorably to the massive swings we’ve seen in recent sessions. With oil down as much as 9%, it was constructive to see the market slip only a fraction of a percent. That shows a big chunk of the oil story is already priced in. Anyone afraid of plunging oil prices sold weeks ago, and is why today’s oil dip didn’t concern current owners much. In fact, it was quite bullish to see the market break into the green toward the end of the day. That is, until the ECB rained on our parade. Without getting too technical, the ECB decided to play hardball with Greece’s newly elected, anti-austerity leaders. This high-stakes game of chicken roiled markets in the final minutes. But the question we have to ask is if Greece still matters? We’ve been down this road before. Back then numerous financial institutions were vulnerable to a Greek default, but this time it is less of a surprise and the bulk of Greek debt is held by governments. While German taxpayers won’t be happy, at least this time it shouldn’t threaten to seize European banking flows. But that kind of thinking uses logic, not the market’s strong suit in uncertain times. This afternoon’s sell-first, ask-questions-later later mentality could send prices careening dramatically lower Thursday. But at the same time, many traders who lived through multiple Greek crises could see this as just another Red Herring trying to get them to sell their stocks for a discount. Fool me once, shame on you; fool me twice, shame on me. It will be interesting to see which mindset traders show up with Thursday morning. So far overnight futures are down modestly, suggesting the Greek story is not spiraling out of control. 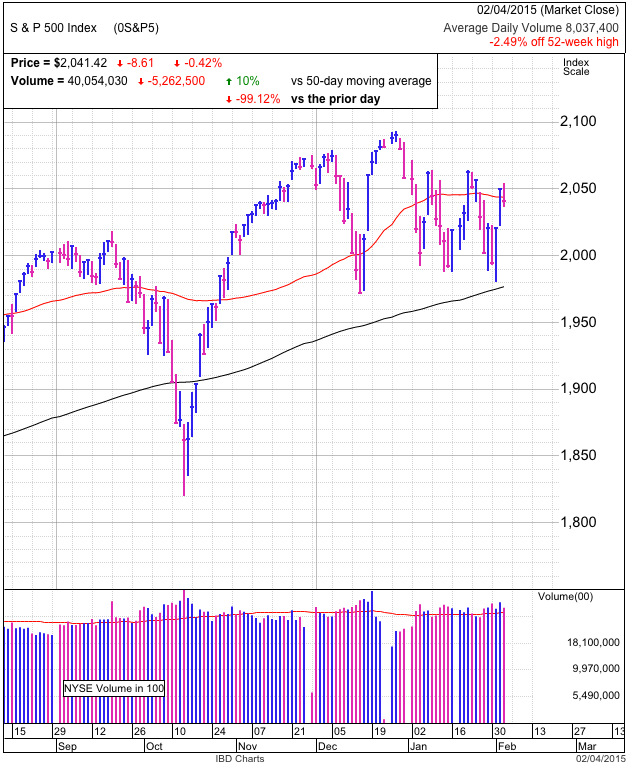 Technically, the market struggled with 2,050 resistance the last two days. Look for a surge of breakout buying and short-covering if we get through this level. That should push us to 2,060, which will be a far larger test of this young rebound since that is where we stalled multiple times in January. On the downside, be wary of an inability to reclaim the 50dma and 2,050. 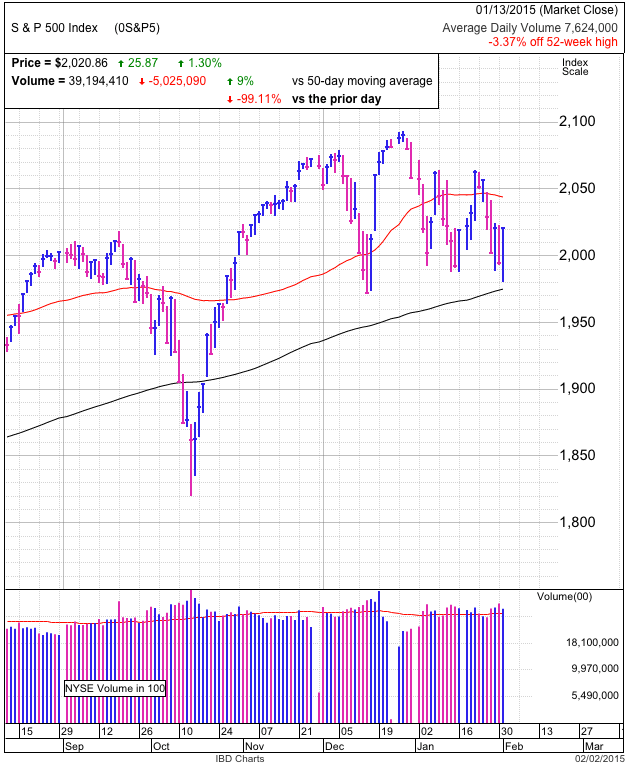 If the market cannot keep recent gains and slips under 2,020, then we will most like continue sliding through the 200dma. Stocks exploded higher for a second day. Some claimed headlines out of Australia, Europe, and the oil market were the catalyst for this rebound, but the market’s stubborn resilience at 2,000 was telling us days ago that it wanted to go higher. When prices refuse to break down on bearish headlines, it doesn’t take much to send us higher. 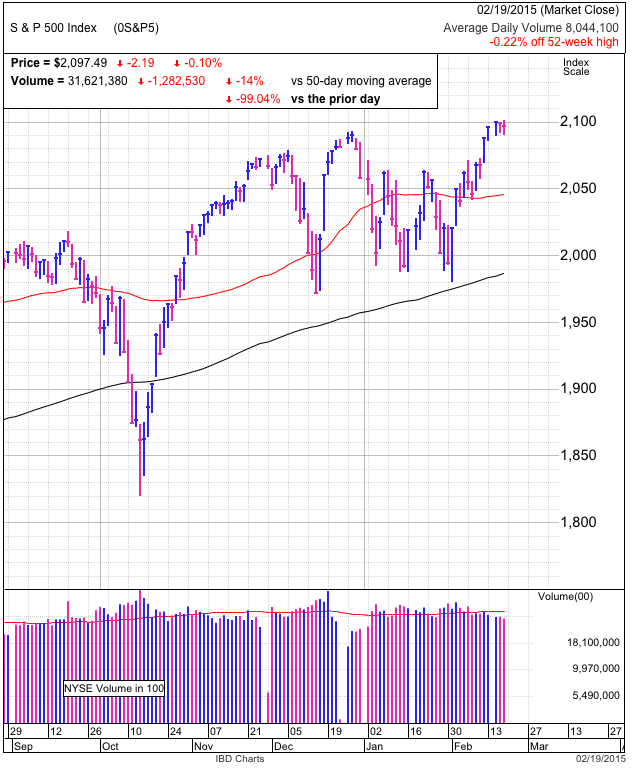 Volume was well above average as shorts were squeezed when we crossed technical resistance at 2,020 in early trade and broke above the 50dma late in the day. Any short with disciplined stop-losses was sent scrambling by this strength. We closed just a hair under 2,050 and this will be the next meaningful level the market needs to summit if this rebound is to continue. But the bigger test will be the third attempt at 2,060, a level two previous rallies stalled at in January. Sentiment remains fairly bearish. While today’s rebound softened some of that pessimism, the 70-point rebound has been so swift, few have had the opportunity to buy back in. That means there is still a huge pool of recent sellers that need to get back in if the market keeps going up. Reactive sellers become reactive buyers, and the volatility continues. An increase in volatility is a common symptom of changes in trend and I remain wary of this market over the medium-term, but as a swing-trader is hard not to exploit this bounce for a quick buck. I’m not sure if we will set new all-time highs, but breaking 2,060 and triggering another round of breakout buying and short-squeezing seems likely. This morning stocks continued Friday’s late-day sell off and undercut recent support at 1,990. This was the lowest we’ve been since mid-December and the technical weakness triggered a wave of stop-loss selling. But it didn’t devolve panicked rush of the exits and we quickly bounced off 1,980, ultimately closing higher by a very respectable 1.3%. Today’s wild, 120-point intraday ride continues the wide and loose trade. While volatility is rarely good for markets, the inability for threatening headlines and dramatic price-action to trigger wider selling leads me to believe we are close to a near-term bottom. The market’s given us plenty of reasons to sell, yet owners and buyers have stubbornly hung on to this 2,000+/- region. I remain fairly pessimistic, but when the market isn’t doing what I think it should, then I have to reevaluate. Resisting so many opportunities to breakdown tells us there is more support than most assume. I continue to be wary of the market’s medium-term prospects, but when it doesn’t want to go down, then we cannot fight it. Even if this is just a bull trap that stalls near the 50dma, it is best for shorts to take profits and step aside. Part of what makes me reconsider my negative outlook is how pessimistic traders have become. 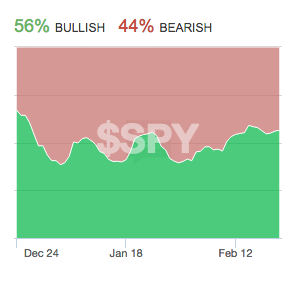 Stocktwits’ SPY bullish sentiment dipped under 40%, a fairly reliable buy signal recently. Many of the gurus on TV also expect us to continue sliding. But if the pessimists have already sold and those still holding are hunkered down and prepared to sit through bigger declines, then who is the incremental seller? When we run out of supply, then it doesn’t matter what the headlines are.